Two of the strongest singer/songwriters in the genre today. Slaid Cleaves has graced the Night Eagle stage one time, traveling to our hills from Texas, although he's originally from Maine. Mary Gauthier who once lived in the Boston area but now lives down south has also played the Night Eagle before, but not nearly enough. She won huge acclaim for her "Mercy Now" CD a couple years back; even Bob Dylan played a song from it on his radio show! If you like tunes that are about something, this show is for you. 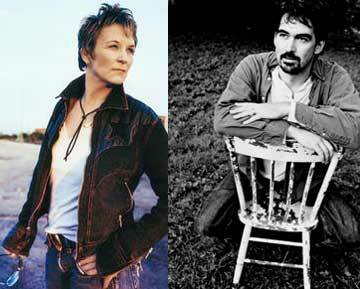 Mary Gauthier In the case of Mary Gauthier, four words are worth a thousand pictures. Between Daylight and Dark, her new Lost Highway album, finds her aiming her compass at the sky and searching for home. It is from this longing for home that this group of songs has emerged, and they fill Gauthier’s new album with both hope and anguish, with faith as well as fear. Mary Gauthier knows these places well, having traveled through a night that had stretched into years, from a turbulent Louisiana childhood through odd juxtapositions of accomplishment and devastation. The result is reflected in the music, starting as a trickle of songs almost from the moment of her sobriety and swelling into the stream that fed her first two self-released albums (Dixie Kitchen, Drag Queens in Limousines), an indie-label release (Filth and Fire), and her stunning Lost Highway debut (Mercy Now). Acclaim has followed Gauthier. Mercy Now was continuously “discovered” and lauded in the two years following its release, earning mentions on a score of year end “best of” lists in ’05, including the Los Angeles Times, the Chicago Tribune and No Depression. The album even received a benediction from Bob Dylan, who included one of its songs on a playlist for his XM Satellite Radio program. Doing roadside van repairs, hauling equipment in and out of venues, answering a dozen e-mails a day, planning and booking tours and their financial details, these are not things Maine-raised songwriter Slaid Cleaves envisioned when he said goodbye to a string of day jobs and became a musician full time. But perhaps these mundane tasks ground him, for he is revered for turning out rawneck songs that capture the essential struggle of the Everyman within the resin of a fine melody. The characters that traverse his open sky songs are down but never out, forever waiting on something better, something earned. You don’t know whether to feel sorry for the poor saps for their lot in life or envy them their indefatigable hope. Be they race track dreamers, heartbroke gamblers, or barroom fighters, all yearn for a better deal but accept their fate with resignation and even the wisdom of those who can see things for what they are. Cleaves is skilled at summing up the whole drift of their lives within their midlife revelations while tightly wrapping the package with sing-along melodies.